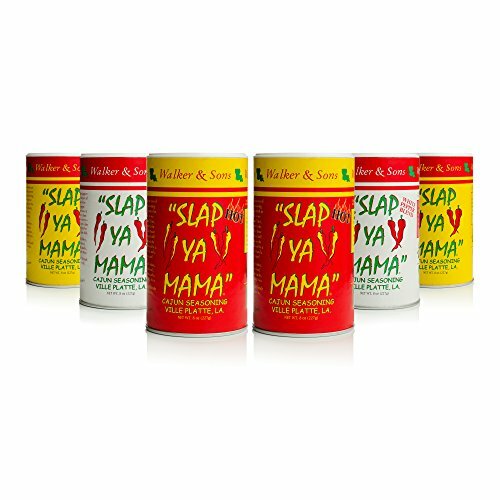 Includes 2 Cajun Seasoning Canisters: Slap Ya Mama Original Blend Cajun Seasoning 8oz is a great mixture of spices that can be used on any dish. Not too spicy and full of flavor, everyone will love how it enhances their food! Includes 2 Hot Cajun Seasoning Canisters: Slap Ya Mama's Hot Blend of spicy seasoning is sure to set your mouth on fire, but at the same time it will add that unique Cajun cooking flavor to any dish. Includes 2 White Pepper Blend Canisters: Slap Ya Mama White Pepper Blend is an excellent Cajun blend for those who can't or don't want to consume black pepper. It's a little spicier than the original blend and provides a unique taste because of the use of the white pepper. It's perfect on seafood! Add Real Cajun flavors to Jambalaya, Gumbo, Etouffe, Shrimp and Crawfish.